Creditor Clerk. 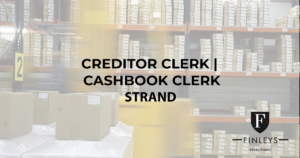 Our client is a packaging manufacturer and has a vacancy for a Creditor | Cashbook Clerk. The successful candidate must be a good communicator, self-motivated, dedicated and a team player. Must be meticulous and manage tasks efficiently and must be able to work under pressure. Have an excellent knowledge of Cashbook & Bank Recons and the Creditors System. Excellent oral and written communication skills are required to make this position a success. Be able to multi-task and work under pressure and meet deadlines. Our client offers a salary of between R15 000 and R22 000, depending on experience and qualification.